Pictured from left to right: JoAnn Gillis, Instructor; Anna Page; Joseph Littlejohn; Deb Favinger, Instructor; Irma Colon Escute; Jill Leitschuh, Instructor; Beulah Sturgies; and Ashley Baker, Instructor. Pictured from left to right: Beckie Kimbrell, Coordinator; Kelly Hunt; and Hilda Copeland, Instructor (not pictured Dorothy Momosea). 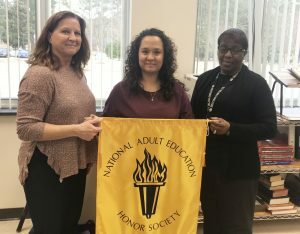 The College and Career Readiness division of Continuing Education at Sandhills Community College recently inducted students into the National Adult Education Honor Society (NAEHS). Those recognized on January 15 were Irma Colon Escute, Joseph Littlejohn, Anna Page, and Beulah Sturgies. On January 17 Kelly Hunt and Dorothy Momosea were recognized at the Sandhills Hoke Center in Raeford. 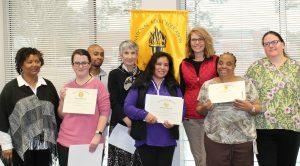 “We believe honoring our students for their hard work and commitment to learning instills confidence and the desire to achieve more,” said Nicole Worley, director of College and Career Readiness. NAEHS members receive a Certificate of Membership, a NAEHS lapel pin, a letter of recommendation for employment, and a letter of recommendation for financial assistance for future educational endeavors. Student NAEHS members never pay dues, their only obligation is to encourage family members and others to take advantage of local adult education programs. The department at Sandhills was granted a Membership Charter in the NAEHS in October of last year. The mission is to provide meaningful recognition to deserving adult education students, to improve student employment opportunities, develop student ambassadors for local adult education programs, and to create adult education awareness with school administrators and state legislators. Student selection is based on dependable attendance, a cooperative attitude, and work ethic. All adult education students in College and Career Readiness are eligible. 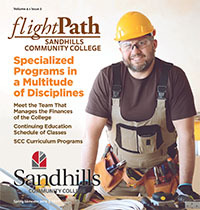 For information about Sandhills Community College’s free adult education programs in Moore and Hoke Counties, go to www. sandhills.edu/ccr or contact Nicole Worley at worleyn@sandhills.eduor 910-695-3784.